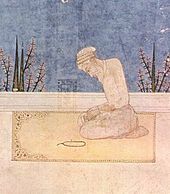 Aurangzeb, the 6th Mughal emperor was a sadistic religious bigot and a typical specimen of Mughal fundamentalism and terrorism. He, as an orthodox Muslim and similar to many Islamic rulers of India, was notorious for his hatred and destruction of all things infidel/ Hindu. "Meantime Aurangzib had begun to give free play to his religious bigotry. - In April, 1669 he ordered the provincial governors to "destroy the temples and schools of the Brahmans... and to utterly put down the teachings and religious practices of the infidels"
- The wandering Hindu saint Uddhav Bairagi was confined in the police lock-up. - The Vishwanath temple at Benares was pulled down in September 1669. - The grandest shrine of Mathura, Kesav Rai's temple, built at a cost of 33 lakhs of rupees by the Bundela Rajah Birsingh Dev, was razed to the ground in January, 1670, and a mosque built on its site. "The idols were brought to Agra and buried under the steps of Jahanara's mosque that they might be constantly trodden on" by the Muslims going in to pray. - About this time the (new?) temple of Somnath on the south coast of the Kathiawar peninsula was demolished, and the offering of worship there ordered to be stopped. - The smaller religious buildings that suffered havoc were beyond count. - The Rajput War of 1679-80 was accompanied by the destruction of 175 temples in Mewar alone, including the famous one of Someshwar and three grand ones at Udaipur. - On 2nd April, 1679, the jazia or polltax on non-Muslims was revived. The poor people who appealed to the Emperor and blocked a road abjectly crying for its remission, were trampled down by elephants at his order and dispersed. - By another ordinance (March, 1695), " all Hindus except Rajputs were forbidden to carry arms or ride elephants, palkis, or Arab and Persian horses." - " With one stroke of his pen he dismissed all the Hindu clerks from office." - Custom duties were abolished on the Muslims and doubled on the Hindus."